After three consecutive victories for Niki Lauda's Ferrari it looked as though the Austrian was on course for a dominant run to the World title and it was no surprise when he qualified his Ferrari 312T on pole at Zandvoort, outrunning his Ferrari teammate Clay Regazzoni by a few tenths. Third fastest was James Hunt (Hesketh) a few hundredths faster than Jody Scheckter in the Tyrrell. 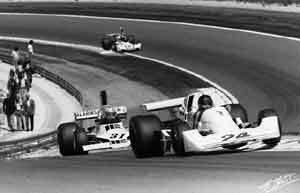 Next up was Carlos Reutemann (Brabham), Emerson Fittipaldi (McLaren) and then came an impressive Tony Brise in the Hill. Brise had a new team mate for the weekend as Graham Hill had found more backing from Esso and had taken on Alan Jones who was out of work after the Stiller team decided not to continue. Also missing from the action was Mario Andretti (busy racing in the United States again) although Ensign was back in action with Gijs Van Lennep standing in for the injured Roloef Wunderink. The only other new face was Hiroshi Fushida in the Maki but as the team did not have a spare engine its involvement in the weekend ended quickly. It was raining at the start of the race and so Lauda had an advantage and took the lead while Regazzoni lost out to Scheckter in the run to the first corner and ended up third with Hunt right on his tail. Behind them Jochen Mass (McLaren) was ahead of Pryce although that situation was quickly reversed. In the early laps little changed but then the track dried and it was down to strategy. Hunt pitted early for slicks and ended up in the lead with Jean-Pierre Jarier (Shadow) another early stopper getting into second place. Lauda was down to third. The order remained the same until the 44th lap when Lauda finally caught and passed the Shadow after an exciting battle. A lap later Jarier suffered a tire failure and spun out. Lauda set off after Hunt. Back in third place was Scheckter with Regazzoni on his tail and they remained in that order until lap 68 when Scheckter retired with engine failure. For the last 15 laps Hunt and Lauda diced for the lead but Hunt managed to stay ahead and won by a second. It was his first Grand Prix victory and the first (and only) victory for Hesketh Racing.